Gowri and Alex Sharma’s daughter, Kavita (10th grade), started at Parish in the 5th grade. As Kavita has explored interests in STEM, athletics and global studies through ParishAbroad, Gowri and Alex have generously given their time and talents to the Parish community. Alex serves on the Board of Trustees, and the couple served as grade-level captains for the Parish Fund. The family is also playing a significant role in the Limitless campaign, committing $100,000 to help build the new Performance & Community Center. How did you know Parish was the right school for your family? Alex: We were looking for a school focused on intentional learning that would provide Kavita with a progressive education. When we found Parish, we discovered that the School leaders are true innovators. They are always looking to the future and modeling an openness to change that is part of the School’s culture. How has Parish helped Kavita develop her passions? Gowri: Kavita loves STEM and wants to become an aerospace engineer, but she is not seen only as a “STEM kid.” She has explored many subjects and activities, and students have a genuine respect for each other’s interests. So, she can be a member of the Rover team, play softball, be an Ambassador and have friends involved in other different areas, too. How has Kavita’s participation on the Parish Rover team enhanced her experience at the School? Alex: The Rover team gives Kavita the space to truly explore – to try things that may or may not work – all in an environment where it’s safe to make mistakes, then learn from them. Jenn Makins [Director of STEM Education] really encourages hands-on problem-solving. She treats the students like adults in a STEM setting, dividing them into project teams and giving them responsibilities. 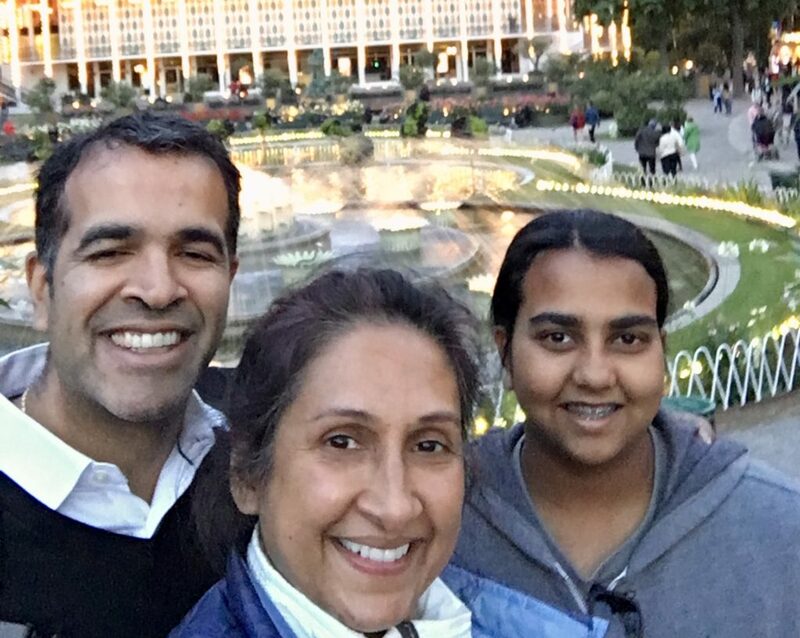 For Kavita, this atmosphere cultivates a sense of fearlessness, where she is learning that failure is part of the process that leads to success. What has been one of Kavita’s favorite programs at Parish? Gowri: Yes, the approach that Rick Dunn [Director of ParishAbroad] takes to global studies is intentional and responsive to the needs of the communities they visit. The students are not simply tourists; they become immersed in the culture, complete service projects and live with families. Although we always trusted that Kavita was safe, she was also challenged to leave her comfort zone and truly learn about another culture. These dynamic experiences from ParishAbroad help build empathy, which we believe is fundamental for young people to develop into global citizens. Your family is very involved in Parish, but not heavily in the arts specifically. What prompted you to support the Limitless campaign to build a new Performance & Community Center? Gowri: We believe in Parish, its vision and its educational philosophy. But, equally important, we believe that true philanthropy is embodied by the saying, “A rising tide lifts all boats.” By investing in Parish, we know that Parish will in turn invest in our child as well as her peers. Ultimately, we hope our gift will create a ripple effect that will help elevate the community as a whole.